In the 21st century, adolescents aged 14-18 are bombarded by information of a volume and frequency unthinkable just a few years ago. What they absorb shapes their opinions and beliefs, their knowledge, and ultimately their behavior; influencing, in turn, the way they operate within—and contribute to—their communities and society at large. As media exposure has never been higher, it is important that adolescents are conscious and aware of the information they encounter and are able to understand it and evaluate it from a critical perspective. In the 21st century, critical media literacy is an imperative not only for the wellbeing of individuals themselves—imagine the young person unable to discern between valid and fallacious health advice--but for peacebuilding, public safety, and participatory democracy. Media literacy can empower youth to be positive contributors to society, to challenge indoctrination and anti-social messages, and to serve as agents of social change.  The aim is to help adolescents become competent critical thinkers, literate in all media forms they encounter, empowering young people to exercise agency over the interpretation of what they see, hear, and read. The critical media literacy curriculum, presented here, is a non-formal educational response that expands the notion of literacy to include different forms of mass communication and new technologies, such as TV, social media and online portals. It deepens the potential of critical thinking to analyze relationships between media, audiences, and information. A problem with media culture is that it can advance sexism, radicalism, ethnocentrism, homophobia, and other forms of prejudice, and contribute to the proliferation of misinformation, problematic ideologies, and questionable values, accordingly promoting a dialectical approach. “Blind” dependency on media surrenders youth’s active participation and civic duties to question, challenge, and correct social injustices. This is why it is crucial that adolescents are empowered to recognize this dynamic, to approach information critically, to identify and examine bias, and to judge the value, authenticity, and authority of the information they encounter. Fundamentally, critical media literacy encourages participatory culture. Participatory culture in turn increases peer learning, shifts attitudes about intellectual property, diversifies cultural expressions, develops workplace skills, and empowers conceptions of citizenship. The CML curriculum provides resources for those interested in exploring, questioning, thinking, and writing critically. The aim is for you to be become critical and independent thinkers, as well as agents of the social change you wish to see. In addition to some working definitions, the curriculum provides an opportunity to inquire and practically apply lessons. Here you will find ‘games’ and exercises you can engage with individually and in groups. Critical thinking is a way of thinking that requires the identification of commonly held truths and beliefs, as well as stereotypes and prejudices. Critical thinking is a process; it requires one to rethink assumptions and to generate new perspectives, definitions, and understandings. Through critical thinking we recognize that there are different approaches to making assertions, claims and arguments, and that different meanings can be attributed to the same events, issues, data, information. You can play this game alone or in a group. If you are a larger group, 8 people or more, you can split into two groups. Alternatively, you can first workshop the first word and then the second, or conduct the exercise alone. Media group: start by adding words associated with the word “media”. For example, the first person says “TV”. The next person repeats the previous word and adds another word link, e.g. news, and so on. To keep the association going, allow five seconds for each word link. See how many linking words the group can get. During this time one of you keeps note of the words proposed. Thinking group: start by adding words associated with the word “thinking”. For example, the first person says: “mind”. The next person repeats the previous word and adds another word link, e.g. brain, and so on. To keep the association going, allow five seconds for each word link. See how many linking words the group can get. During this time the trainer writes the words on a flip-chart/white board. Based on the word link each group comes up with a definition for “media” and a definition for “thinking”. The group can then discuss if these definitions are the same or different from how they had previously thought about the two. How are they the same, or different? To help the discussion you can use the following table with examples and add other definitions. In this section we look at how categories are put together, that is, to think the other way-around. You can exercise by looking at particular notions (a word, a concept) and discover where its definition/common meaning comes from. These exercises below exemplify how critical thinking leads to identification of commonly held truths and stereotypes and the process of rethinking those. You can identify other sets independently and conduct the same exercise for those. You can workshop this exercise alone or in a group. If you are a larger group, 6 people or more, you can split into two groups. Alternatively, you can first workshop the first word and then the second, or conduct the exercise alone. The participants state what comes to mind when one says ‘man’ and what comes to mind when one says ‘woman’. 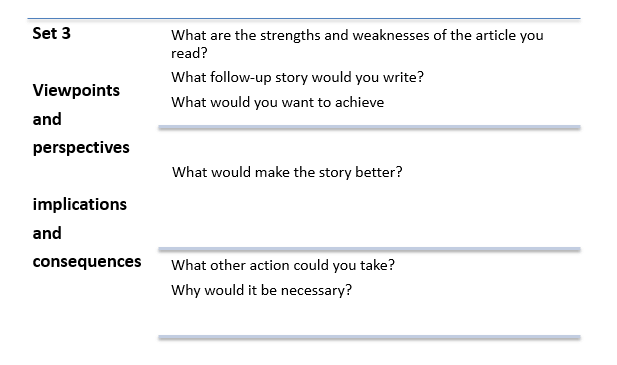 One person fills in the cells (see table below) with responses given by participants. You can also choose one person to be a moderator. The moderator explains the rules, keeps notes, and helps the participants to compare and discuss. They are also responsible for making sure that all participants have an opportunity to speak and give turns to the participants. The moderator asks the participants to provide examples that illustrate how the different words that came to mind fit in one or the other category. Why would one argue that these words fit in either category? Can one think of examples where such is not the case? Would it be possible to switch the words around (what is listed under “man” to be listed under “woman”, and vise versa)? How would one argue about the accuracy of the switch? 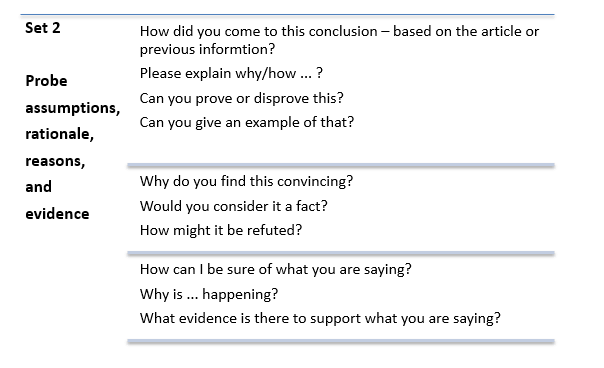 The participants state what comes to mind when one says ‘belief’, ‘science’ and ‘truth.’ One person fills in the cells (see table below) with responses given by participants. You can give as many definitions/descriptions that come to mind. As a group you can then discuss the differences and similarities between the three. How are they different? Why? How are they the same? Why? Belief: an acceptance, trust, faith, and confidence that a statement or something is true or real. Truth: a fact or belief that is accepted as true. One example to consider is the difference in explanation - between creationist theory and the big bang theory – regarding the creation of the universe and life on earth. Are these theories based on scientific knowledge or belief? How do the derive their thruths? In what ways do they make claims about truth? Representation of a broad timeline of the universe according to bing-bang theory. 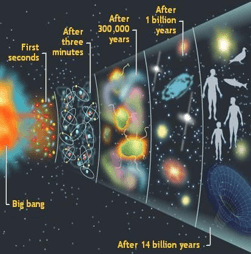 Big bang theory – states that the universe came about through a cataclysmic event, and is based in the observed (scientific) expansion of the universe, cosmic background radiation, abundance of the elements, and the laws of physics. Representation of Adam and Eve. Creationism – states that the Universe came about through divine intervention. For the critical reading exercise you are given two articles, which you will read and reflect on with the help of questions provided for you. Who are the people in the story and how are people being described? What are the events in the story and how are they ordered? 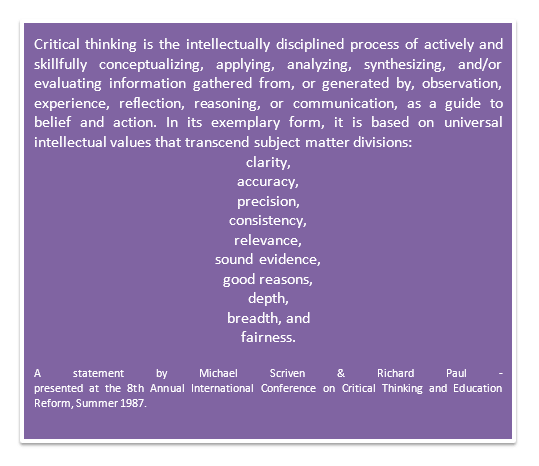 A central part of critical thinking and writing is to learn how to identify and understand the rationale, evidence, questions, viewpoints and perspectives in a given text or material. The questions sets provided below can help you identify each of these. You can answer the questions individually or by working in groups. Answer the questions below by referring to the notes you took while reading the article. Writes down your answers in bullet points. Take 15 minutes to deliberate amongst yourselves if working in groups. You can then also compare your answers. For Set 2 below imagine that someone is asking you questions about the responses you provided to Set 1 questions. For example, the first question asks: “how did you come to this conclusion…?” You need to identify information in the article, or otherwise, that supports your conclusions. Once you have read the articles provided in the critical reading exercise (I.5.) you can engage in a simulation exercise. (You can also play this simulation using another article of your choice. Each group/person will work to develop their position while presenting one of the actors in the articles. You have 20 min to prepare. Each group delegates one member to present their position. The delegates are given 10 minutes to present. Group/person one will present the position of UNMIK. Group/person two will present the position of an affected community member. Group/person three will present the position of the lawyers representing the community. For the presentation (position argumentations) the groups should refer to specific information, evidence, and stories, provided in the article. This way they are expected to present their position based on the narrative of the article. Identify in the article claims, arguments, and information, made/provided by each source. Present the same claims, arguments, and information. Write these statements down and synthesize in short sentences. Supplement presentation relying on answers generated to Set 1 - 3 questions.